After Star Trek, James Doohan Starred In Another Sci-Fi Show Called? Looking at Star Trek through the eyes of a modern viewer, it’s difficult to imagine the major players in any other roles as Star Trek seems so much larger than life. The original Star Trek series, however, was quite short lived compared to the greater arc of the Star Trek franchise. Star Trek: The Original Series, which was then simply known as Star Trek, aired for only three seasons between 1966 and 1969. Naturally, of course, the actors in the series didn’t hang up their hats and wait a decade to reprise their roles in 1979’s Star Trek: The Motion Picture. Not only did many of them keep working on various projects, but James Doohan—the lovable Chief Engineer Montgomery “Scotty” Scott on the Enterprise—even took up another sci-fi role. In 1978, Doohan starred in a CBS sci-fi children’s show called Jason of Star Command (a spin off of another sci-fi children’s show, Space Academy). The premise of the show was that Star Command was a secret organization tasked with protecting the galaxy from evil (which primarily took the form of Drago, a space warlord). 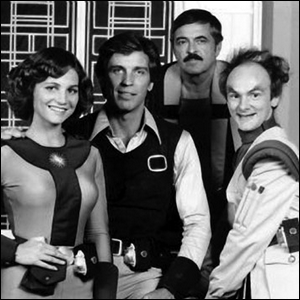 While the show centered primarily on the antics of Jason (seen in the photo here, second from left, and played by Craig Littler), the leader of Star Command was Commander Canarvin, played by Doohan. After season one of the show, Doohan left to rejoin his former colleagues and film the first Star Trek film.